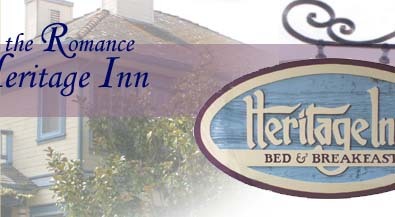 Located at the crossroads of Highway 1 and 101, Heritage Inn is a natural home base for touring in all directions. Just minutes from downtown. Check-in is 3:00 to 8:00 p.m. There is no fee for cancellation 7 days prior to reservation. On shorter notice, refunds will be given only if room is rebooked. Click here for map, or here for driving directions. Breakfast is served from 9:00 to 10:00 a.m. Please notify the hostess of special dietary needs. Please enquire about our special rates for military and business travelers. Pets by special arrangement only. There are no TVs in the rooms.